Welcome to our warm, character, three-bedroom home with a quirky twist. PLEASE NOTE, PRICE SHOWS AVERAGE, click on the dates you require, you'll be surprised to see how reasonable our nightly price is. 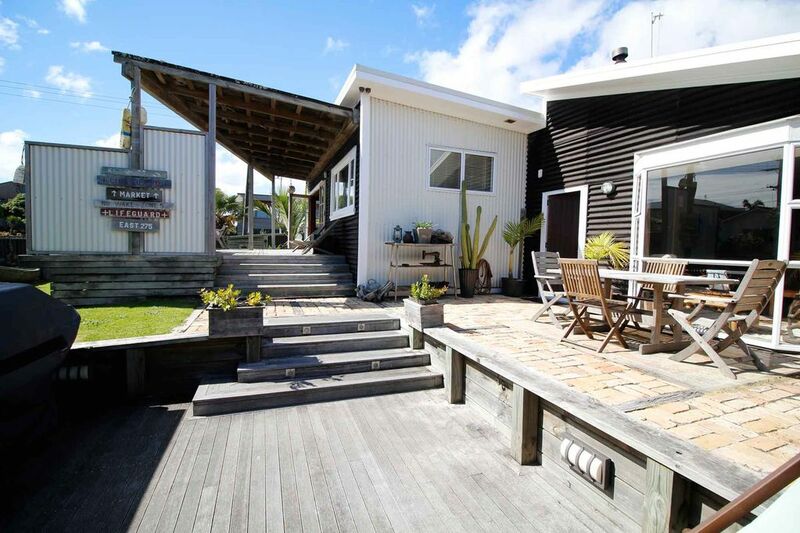 The all day sun and indoor/outdoor flow, makes this is a perfect destination for your next Mt Maunganui get-a-way. Fully furnished bedrooms can sleep up 6, with an additional double fold-out futon couch, single trundler bed and single pull out foam mattress - it can sleep 10 people if need be. Two lounges means downstairs for adults and upstairs with bi-fold doors out to the east-facing deck with all day round heated spa pool. Full Internet access, Freeview TV available. A modern bathroom, with shower, toilet and bath, as well as an additional toilet. Dine in the indoors or in the sunny outdoor areas. The beach is straight across the road, so be prepared to hear the surf at night and relax in the heated spa on your return. Located just one block away from the busy Bayfair Mall (two supermarkets), as well as Baywave Aquatics Leisure centre and Baypark ASB arena. Berescourt playground park is 3mins walk away, soccer amenities 6 mins walk away and cafes, restaurants (OBR) within walking distance. Why not walk home along the beach after dinner? This rustic character home is not perfect, but has both a relaxed beach feel, as well as a mediterranean/french vibe with it's unique indoor/outdoor decor. Don't be deceived by the photos, the house is a lot bigger and more spacious than the photos convey. Whole house, off road parking for 3-4 cars including internal garage. Close to events centre, beach, park, sports facilities, golfing, Baywave aquatic centre, Bayfair mall, downtown Mount Maunganui, Tauranga airport. 10am checkout and 2pm check-in. Small heated spa is available all year round. Please TURN OFF HEATING OR COOLING appliances before you leave to avoid any additional costs for power. Don't expect a new house when you book. Better suited for family groups or mature guests. • Avoid putting anything in the spa (other than yourselves) or walking/sitting on the spa pool lid or filter cover. Replacements costs high. • Outdoor ornaments are for viewing only. • Rubbish and recycling day: Monday morning. • Some spa pool maintenance : Poor half measuring spoon of Oxiclear into spa every second day. The pump will automatically clean spa. Love spending time at the beach with the kids. Across the road from the beach, close to all amenities including Berescourt park, Baywave aquatic center. Fully fenced for young families. Voted best NZ beach fourth time in a row - Trip Advisor 2017. Beach is across the road. 250 metres walk. Great location to beach shops and cafes in the mount close by ! Amazing location, so much space with an awesome outdoor area. Absolutely loved the house! Would love to rebook again for all the family, thank you. After traveling and sightseeing all day, we were glad to arrive at a warm and comfortable holiday home. Close to the beach and shopping nearby. Very comfortable beds an lounge room with plenty of room to relax. Awesome property, very well set up especially for the kids, with everything you need. It felt very cosy and homely. We really loved staying there!